Tuesday morning greeted us with beautiful sunshine. 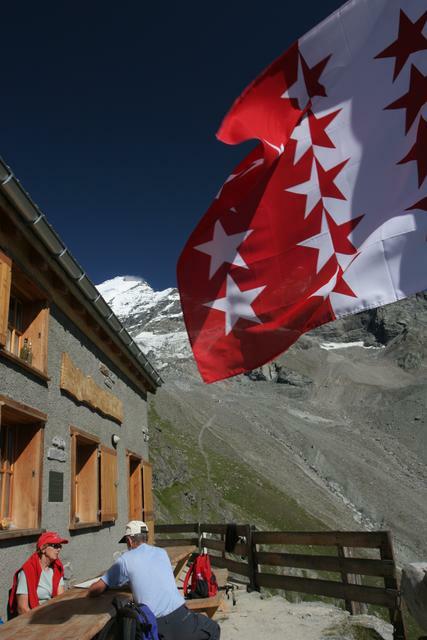 We called the Europahütte which lies on the TMR about half-way between Zermatt and Grächen and is the default shelter for the next section but they were fully booked. Instead we decided to give the new Kinhütte a try. They still had room so we booked two beds for the night. 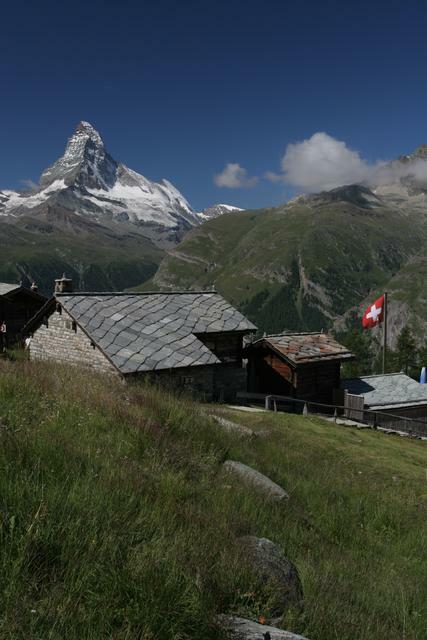 We left Zermatt at 9:10 and hiked up to Tufteren where we got a nice shot of the Matterhorn. After a food break we turned north following the Europaweg. 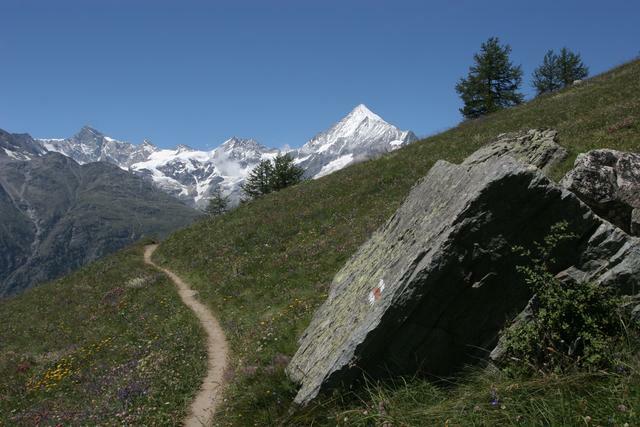 The trail stays between 1900 and 2300 meters and eventually reaches Täschalp. A nice stone chapel and some vacation homes but there was also some construction going on spoiling the scene a little bit. 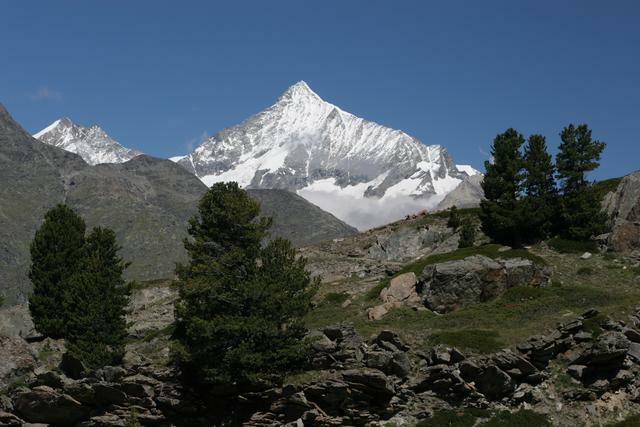 Another shot of the Weisshorn. The alpine flowers were in full bloom at this altitude. After lunch we continued along the trail and encountered a section where it is protected against rock slides with a concrete gallery. 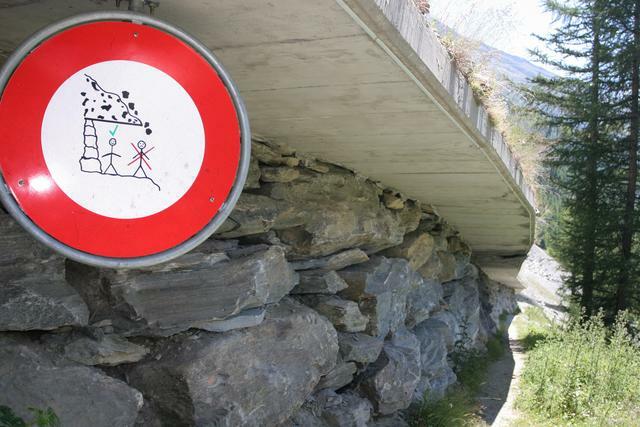 Someone must have had a fun time painting these signs. When we turned the corner into the valley with the Kinhütte we were a bit surprised. It was supposed to sit somewhere right in the cliff. It took us several stops and getting closer to discover it (don't even try at this resolution!). The Kinhütte sits atop a cliff of several hundred meters and is about 400 meters above the Europaweg. It took us about an hour to go up the 'Edelweisstrail' and in fact we did see lots of them. 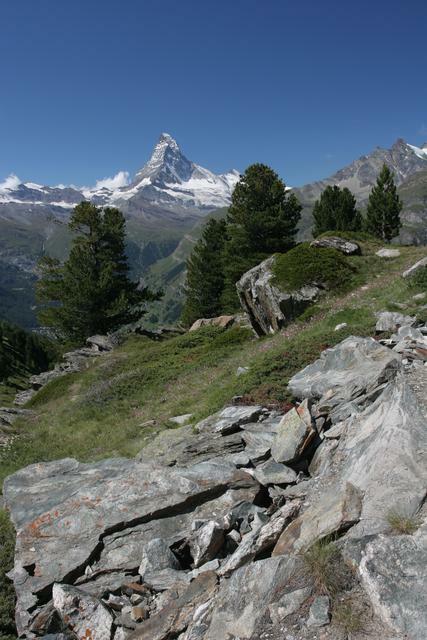 The trail leads through traces of construction and we first thought of an abandoned mine but it turns out that there is a hydro-plant which supplies the cabin with power and a water tunnel which brings water from here to a reservoir on the other side of Zermatt. 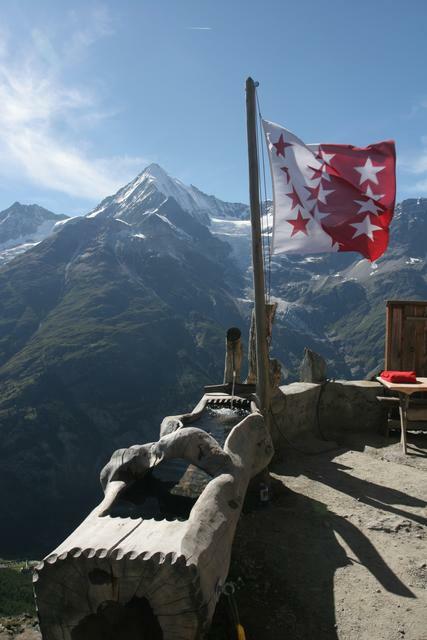 Flying the flag of the Wallis/Valais. 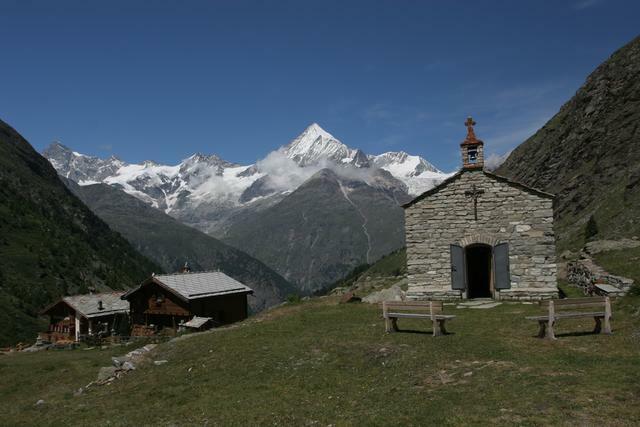 The first Kinhütte was built in 1902 by local mountain guides. After nearly 100 years it was in a sorry state and its substance made a renovation impossible so Viktor Imboden bought it in 1996 and started planning a replacement. It was finished in 2001 after years of hard work. Viktor now runs it and has a photo album documenting the effort which is very worthwhile reading. The hut has a beautiful interior, electricity from a self-installed water turbine and great views from its cliff-top position. It is relatively small with 32 beds and there was only 3 couples at the hut so it was not crowded. 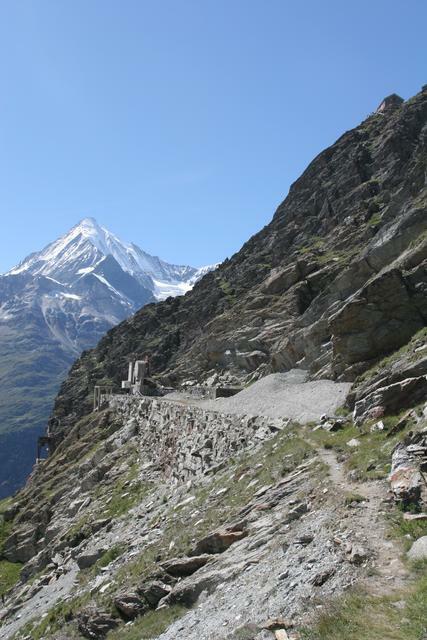 A pleasant change from the night on the Theodulpass. The other guests were very nice and it was very exciting for me to learn that one of them was a professional photographer, Hanspeter Reinhard. With his wife he runs his own publishing house, the Gebirgsverlag, for his work, mostly calendars, postcards and a book about the Swiss mountains. It was very interesting to talk to him and watch him go about taking pictures. 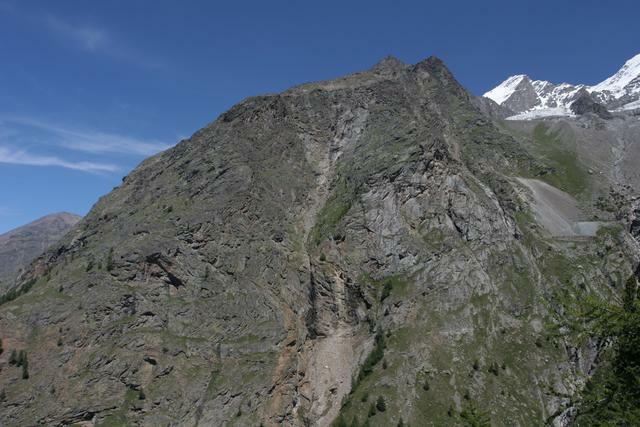 Another shot of the Weisshorn. 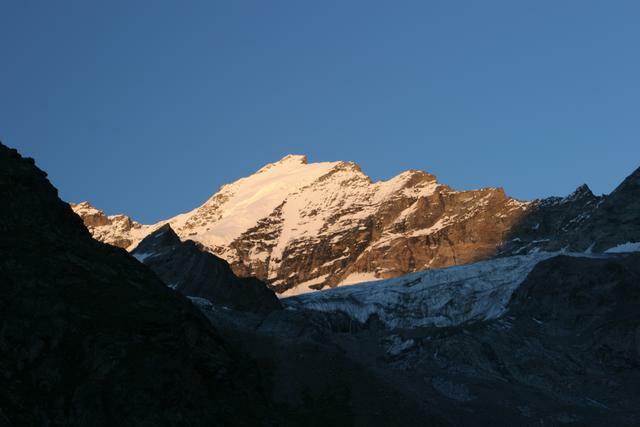 The Täschhorn just before sunset. We had excellent dinner and after long conversations went to bed for a good nights sleep.